As we all know that Ubuntu is an operating system built from the Linux kernel. It is a secure operating system which contains all the necessary applications, such as web browser, text editing programs, spreadsheet, presentation, among others. Now, you can try it in your browser directly without installing it on your PC or Laptop. Ubuntu is an operating system built from the Linux kernel ( Linux Kernel ). It is an open source operating system based on Debian and follows the free software standards. The choice of name is based on the African philosophy of “Ubuntu” and reflects the ideology of the project, highlighting the spirit of mutual support among employees. The Ubuntu Operating system is community development and the product can be shared with anyone. Those who wish to install Ubuntu operating system, they can easily install or share the Ubuntu operating system as it is a free system on the computer and the user is not supposed to pay to use it. The Ubuntu operating system was launched in 2004 by Canonical company. It is advertised as a simple operating system to use and suitable for personal or professional purposes, both on personal computers and servers. 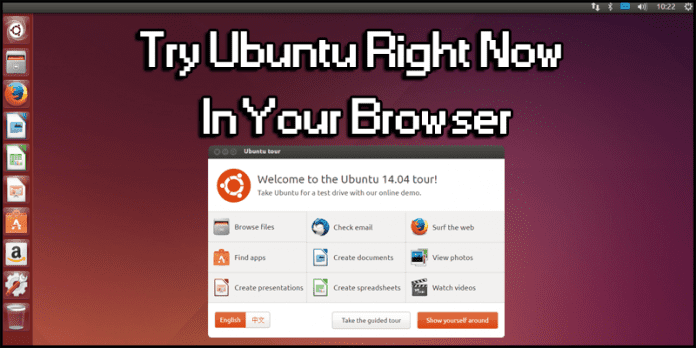 Now you might be willing to experience Ubuntu Linux right now on your PC or Laptop. So, what if I say that yes, you can try or experience Ubuntu Linux right now on your PC or Laptop without installing it on your PC or Laptop. Yes, now you might be thinking that what rubbish am I speaking. No, actually I am not speaking any rubbish because now you can try Ubuntu Linux demo right now in your browser directly without installing on your PC or Laptop. So, this online Ubuntu Linux demo is a good rush for those who are really fascinated by Linux. As the website will provide them the ability to have a quick glimpse at the OS and also it will make you learn and know a couple of important and necessary things. Here is the website link from where you can taste Ubuntu right now in your web browser.